To make a donation to WithOneSeed click on the button below and enter With One Seed in the Sub-fund box on the page. MyCarbonCapture provides you with a real time measurement of the carbon emissions produced through your mobile data usage. Make a small contribution to help replenish the planet by offsetting each time your device emissions reach $5AUS. You can do this by tracking the emissions generated through your mobile device with the MyCarbonCapture app. This will help us to plant and maintain more trees in Timor Leste as part of the WithOneSeed community forestry initiative. 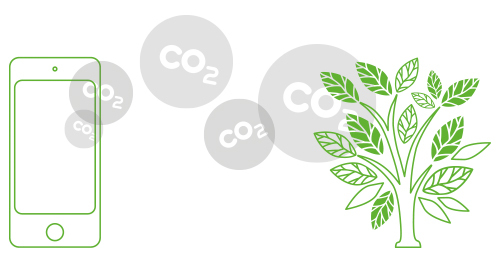 MyCarbonCapture encourages citizens and business to take responsibility for the impact of their computer device use on the environment. Individuals and organisations who wish to voluntarily offset their computer technology use, can make an annual donation of $5 per computer and device to the MyCarbonCapture offsert fund. The funds will be used to plant and maintain trees in the WithOneSeed Community Forestry initiatives in Timor Leste, to make environments sustainable, to end poverty and hunger, to build knowledge and to build partnerships. The Australian Communities Foundation is a public charitable foundation that receives donations into its WithOneSeed Sub-fund and then distributes that money to fund WithOneSeed’s projects. Every $5 donation will result in the planting of 1 tree, pay for its annual maintenance and increase opportunities for subsistence families in Timor Leste to participate socially and economically within their communities.